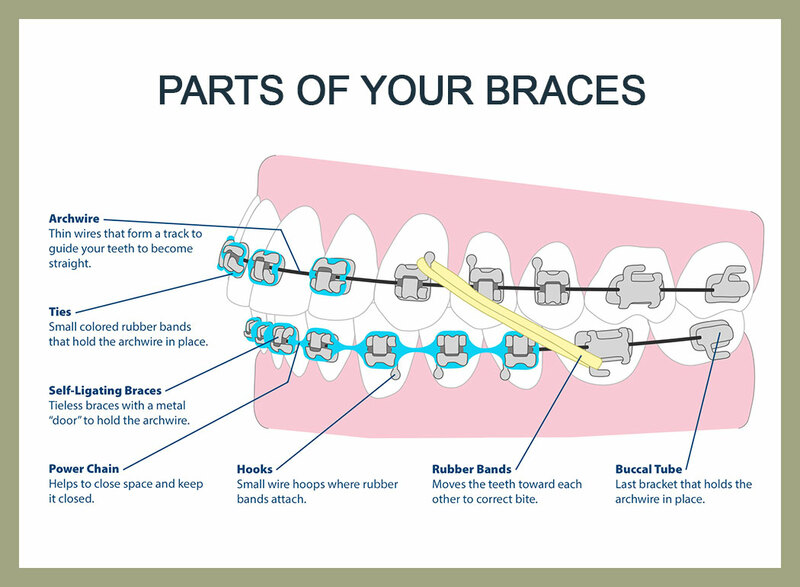 When you first get your braces on, your mouth and teeth may be sore for a few days. Warm salt water rinses can help with this soreness. If the tenderness is bothersome you can take whatever pain reliever you take for a headache or similar pain. Wax placed on the brackets or wires is helpful in alleviating irritated areas on the lips, cheeks and tongue until the tissue becomes tough and accustomed to the braces. Chewing sugarless gum can also work out some soreness in the teeth and jaws. A pencil eraser can be used to push the poking wire down or place wax on the wire to prevent contact with the inside of your mouth. Sugarless chewing gum also works well to temporarily pad a sharp area. If the bracket or band is still attached to the wire, leave it in place and protect the area with wax. If the bracket comes off of the wire and the tooth, put it in a baggie and bring it with you to your next appointment. Try to put the wire back into place using tweezers. If this is not possible, use fingernail clippers to clip the wire behind the last tooth to which it is securely fastened. Wax is usually helpful for areas that have experienced discomfort.